What's Tasting Best Right Now? Rhubarb! When I check the calendar, my mind instantly runs to all things Spring. Bulbs blooming, asparagus, rhubarb, mud on the trails. Looking out my window tells a much different story! Snow is in the forecast through the weekend bringing us right into May. Oh Colorado, your weather never bores me. While sunshine filled 70 degree days leave us wanting to be outside all day long, I have a feeling this weekend we'll be inside baking, crafting, and laying low. 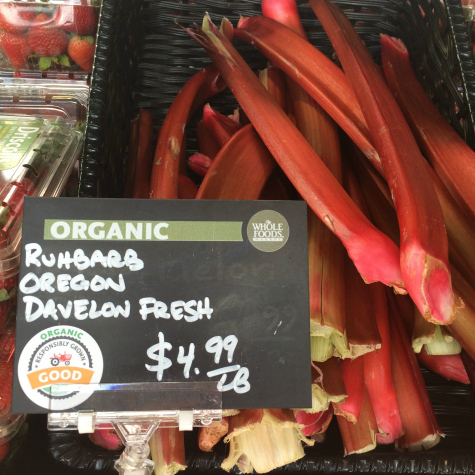 I picked up some rhubarb at Whole Foods Market and I think a pie is in order. See the recipe below or by clicking here to create a shopping list!